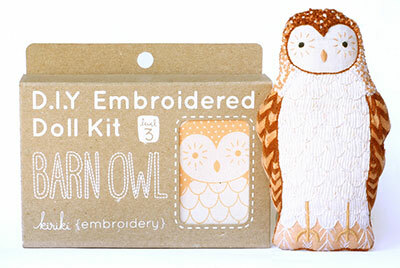 Today begins a series of articles here on Needle ‘n Thread about your embroidery. Last week, I asked for photo contributions from the Needle ‘n Thread community, highlighting your own embroidery projects that were influenced in some way by the content provided on Needle ‘n Thread. Well, I received a glorious influx of email – much too much to include in one article – with fabulous photos of all kinds of embroidery projects. Oh, happy day! I knew I could count on you! Since I’m taking some time off to do a little necessary traveling (as in, unavoidable), it’s a perfect time to share some embroidery from other people with you. Over the next couple weeks, intertwined with regular articles, we’ll be looking at embroidery projects from all over the world, which I hope will further inspire you in your own needlework pursuits. To start, I want to share embroidery from two gals who, learning various stitches through tutorials here on Needle ‘n Thread, have been able to start or advance their own small businesses with embroidery-related offerings. Theresa is a tea-lover! Residing in Seattle (or Coffee-Central USA), she has a hard time finding a really good cup of tea, like the kind that can be had in her native Britain. 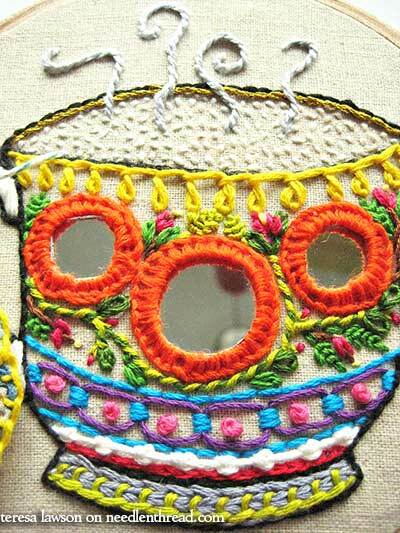 So, with tea on her mind and a determination to try out some new stitches, she worked up this adorable tea cup sampler. I’m not sure if it helped quell the cravings, but it’s definitely cheery enough to chase the blues away on overcast days! Theresa used a whole slew stitches from various stitch tutorials here on Needle ‘n Thread. There’s shisha, basque stitch, chain stitch, whipped backstitch, buttonhole stitch, guilloche stitch, fly stitch, French knots, daisy stitch, Palestrina stitch, satin stitch – a colorful variety in a little cup (with the dangling tea bag, too). I think it’s just darling, and a sunny, cheery way to start the day! Theresa sells her embroidered goods in her Etsy shop, The Monster’s Lounge. I love your website and will be eternally grateful for your tutorials – they taught me how to embroider and I’ve gone on to build a really great little business for myself! The scallops on my Barn Owl were directly inspired by your crewel rooster. He’s one of my most popular kits. Both of these contributions are heartening! They demonstrate that needlework is very much alive today. They also illustrate how, with a little bit of creativity and gumption, you can make an income doing what you love! April 1, 2016 Coloring Book Embroidery – A Glorious Peacock! I LOVE that teacup – it is so cheerful! Oh what lovely embroideries, I like them both the tea obviously reminds of England and it’s so cute, I love the Shisha which I am going to start on my removeable motifs for clothing . The Owl is gorgeous, it’s great that Michelle has gone on to start her own business, amazing what you can do if you follow Mary. Where are you going Mary we will miss you, but you deserve a break I hope it’s somewhere nice. Don’t forget to send a postcard! enjoy. What this article really shows is the power of the online community of stitchers that can learn from a dedicated teacher (that would be you, of course!) and how they can market their goods online. That the articles themselves are adorable is an added plus! Thank you for dedicating so much time and effort to help spread the art of embroidery around the world. We are all much better off for it. 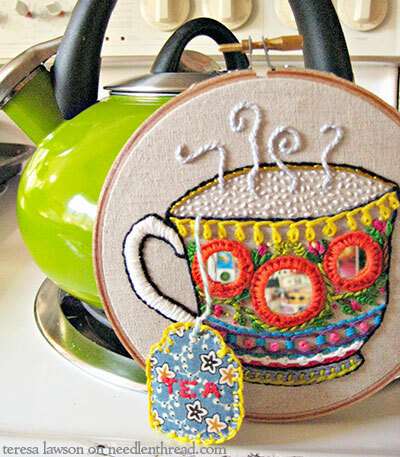 I adore the teacup and the little tab from the teabag, a lovely variety of stitches. The owl is also wonderful. BTW – Theresa – try Simpson & Vail for tea (www.svtea.com) for fine loose tea and teabags. They have been in business since, I believe, the 1920s. I have been buying from them for many years. Their Victorian Earl Grey is my favorite. Oh these are wonderful – and gorgeous. Thanks for sharing that, and the Etsy link. Isn’t it lovely that we all like the same hobby but we all make different beautiful things……This is so bright and cheerful,with a myriad of stitches ! OMG, the tea cup is brilliant! Love it. the tea bag dangling from that cup of tea is inspired! I never would have thought of doing that, what a wonderful idea! And that owl is just adorable! Don’t forget all the stitchers over on Stitchin’ Fingers. That site would not exist without you, and we are all inspired by your work and your teaching. The Seattle lover of English teas should check out Churchmouse Yarn & Teas on Bainbridge Island.